‘Twas the few days before Christmas, and all throughout the GL office, all the editors and interns were getting into the spirit by remembering our fave children’s Christmas books! There are always those go-to titles you read every year to get into the holiday mood, so we decided to list our six all-time faves to help you gear up for Dec. 25. Grab your fam and read along. Happy Holidays! 1. ‘Twas The Night Before Christmas—You can’t talk about Christmas stories without mentioning this one. More than a classic, ‘Twas The Night has become a holiday tradition for many families—right up there with laying out milk and cookies, and hanging stockings by the fireplace with care. 2. How The Grinch Stole Christmas—Dr. 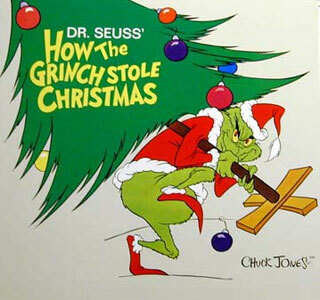 Seuss books are the epitome of children’s books, so of course a beloved Christmas tale from the Doc would make our list. 3. A Christmas Carol—The tale of Tiny Tim, Scrooge and the Ghosts of Christmases past, present and future have become engrained in our hearts as a story that really delivers the true meaning of Christmas. 4. The Last Christmas Tree—This story is so adorable, we couldn’t pass it up. Proud little trees that make orphans happy pull at our heart strings every year. 5. The Polar Express—This fantastic tale always helps us get into the holiday spirit by making us wish we were one of the lucky ones who got to take a field trip up to the North Pole! 6. The Nutcracker—Sugar plum fairies? Princes slaying evil mice soldiers? Come on! This story is a Christmas dream come true for every girly girl. Which is your favorite holiday tale? Blog about it, babes. "Dear Carol, why am I feeling so blue?" Saturday read: "I'm No Hero" by Madeline H.
WATCH: Nick's Blurt is hitting your TV screen this February! Pop in Spoolies, award-winning heatless curlers, for gorgeous waves.